Here’s an Arms Control Association timeline of chemical weapons “moving around or being utilized” in Syria. Putin later entered the war with airstrikes in support of Bashar al Assad. That turned the tide in his favor and unleashed a greater flood of refugees and dead. In the end, the world’s greatest power was reduced to bitter speeches at the U.N. “Are you truly incapable of shame?” thundered U.S. ambassador Samantha Power at the butchers of Aleppo. As if we don’t know the answer. 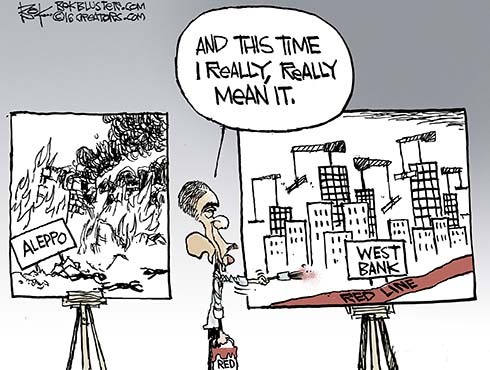 Last week the administration drew a new red line through the West Bank and West Jerusalem for building settlements. 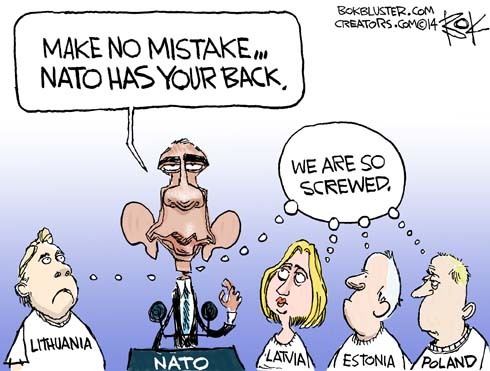 Last week President Obama assured member nations that NATO would defend them. 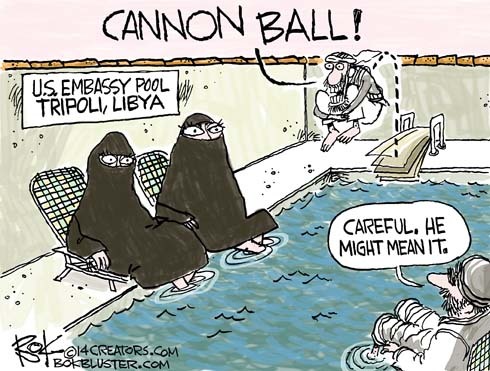 Meanwhile, terrorists frolicked by the pool at the abandoned American Embassy in Tripoli. On Friday Ukraine signed a ceasefire agreement with Russian separatists. Ukraine isn’t a NATO member. The only American military assistance it received where Meals Ready to Eat. Still it was making progress against the separatists. That is until Russian tanks invaded. The beheading of two Americans seems to have concentrated the country’s attention on the use of military force. Even Rand Paul wants to wipe out ISIS. He says he’s always been in favor of war if it’s in the national interest. How far does the national interest go? Pretty far, according to Robert Kagan and Victor Davis Hanson. They both made the same point that when you withdraw military power bad guys fill the vacuum. Brett Bair interviewed three CIA contractors who were on the ground in Benghazi when Ambassador Stevens was killed. They say their station chief told them to stand down. Eventually they defied orders and fought the terrorists, some of whom may now be poolside in Tripoli. Israel, Egypt, Jordan, and the Saudis want Hamas out and Fatah in in Gaza. 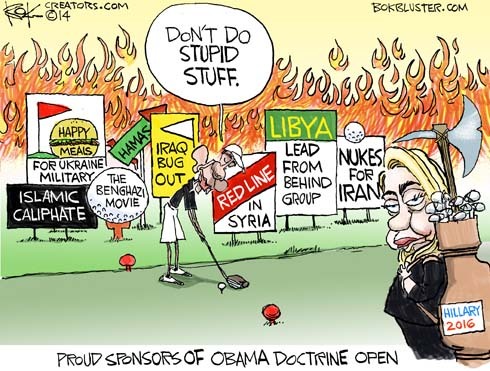 So what did John Kerry do? He met with Islamist Turkey and Qatar to come up with a cease fire agreement that keeps Hamas in power and its rockets and tunnels intact. The Israeli cabinet unanimously rejected the deal. Israel has Hamas on the ropes. Hammas is without friends – save for Turkey and Qatar – which is why Krauthammer called Kerry Hamas’s lawyer. Perhaps because of tragic loss of life, the United States would rather see a ceasefire than Hamas dealt a mortal blow. And that is almost certainly one of the reasons Hamas uses Palestinians as human shields. At one time, launching a military attack on another nation risked not only retaliation but annihilation. When Carthage attacked Rome, that was the end of Carthage. Looks like mutual assured destruction all around is the key to world peace. 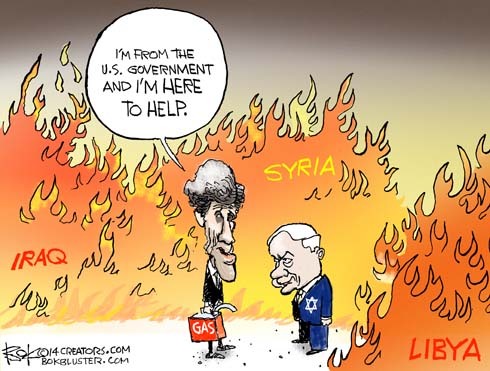 Kerry’s error has been to put so much emphasis on achieving a quick halt to the bloodshed that he has solidified the role of Hamas, the intractable, unpopular Islamist group that leads Gaza, along with the two hard-line Islamist nations that are its key supporters, Qatar and Turkey. In the process, he has undercut not simply the Israelis but also the Egyptians and the Fatah movement that runs the Palestinian Authority, all of which want to see an end to Hamas rule in Gaza. Hamas has fired over 1200 rockets claiming “every Israeli is a legitimate target”. So far only one “legitimate target” has been killed. That’s because of Israel’s Iron Dome missile defense. Israel doesn’t consider individual Palestinians “legitimate targets”. Before striking back at Hamas it warned civilians with pamphlets and phone calls. 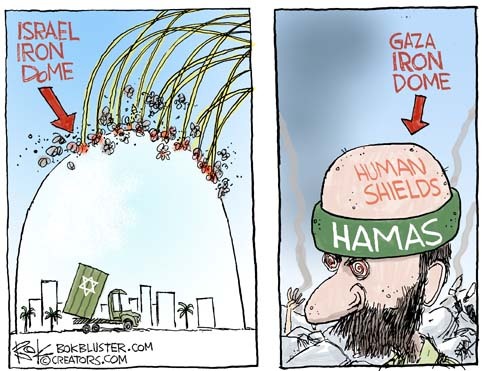 Hamas responded by telling them to stay in place as human shields.